This summer was a great year being at Hume Lake. I think it was my best summer there that I have ever experienced. Something that added to that joy this summer was two things I received while up at Hume. This summer I had two parents send me two different things. One parent sent me a big box of a candy with a cool note in there and the other parent sent a heart felt thank you card. The first note of encouragement came from a family with this box of candy! Now the candy was really cool and we figured out that a parent caught my joke (most jokes are half serious) that I shared in our parent meeting prior to camp to send me up some candy while I was gone. I was not expecting to get what I received but I was so happy. And when I got that box of candy I let our adult leaders have first pick (after I ate a few goodies). This box was stacked full of candy! There was so much candy that I was able to share it with the lead counselors at Hume and even hook up the guys in my cabin. Now the card I got was very encouraging. Its interesting how a simple card can encourage someone when they are loving on their child. 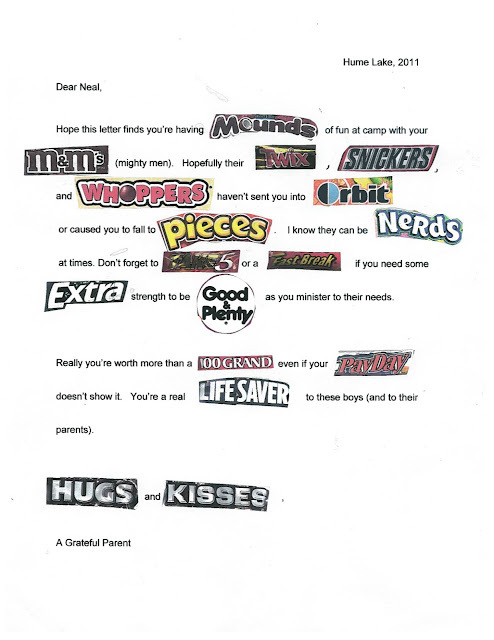 Here is a copy of the letter that came with my box of candy. Very creative!